an inspiring visual arts program that gives independent young women the creative skills, insight, and support needed to define and achieve their goals. 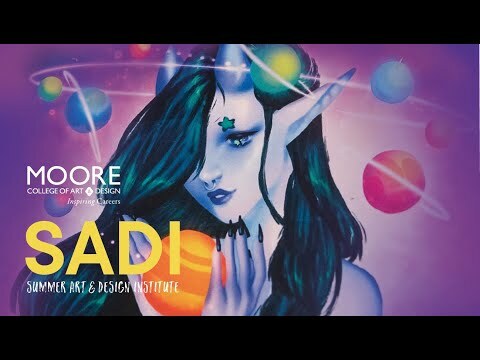 SADI is open to all students in grades 10-12 who wish to develop their art and design potential in new or familiar media while enjoying a college life experience. SADI’s flexible curriculum allows students to explore the range of majors offered by a prestigious college of art and design, expand their skills, and have fun while doing it! Special events include presentations by outstanding artists and designers to assist in portfolio development, college admissions preparation, and broadened career path awareness. Evenings and weekends are for dedicated studio time or activities such as artists’ studio tours and museum visits that build friendships and take advantage of the City’s cultural offerings. Instructors are members of Moore’s award-winning professional faculty skilled in assisting students to think and work as contemporary artists and designers. On the program's last day, students, family and friends share the thrill of a student exhibition and festive closing ceremony.